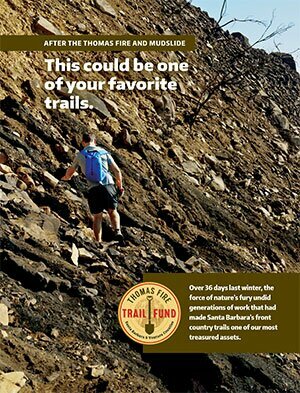 Thank you for considering a donation to the Thomas Fire Trail Fund. All gifts are tax deductible to the full extent allowed by law. You will receive a written acknowledgement of your gift in the mail. Please choose the way to donate that is best for you. We offer safe and secure online donations or the option to mail a check. We need community support to finance this ambitious project. To donate online click on your choice of the blue buttons or download our pledge form to mail a check. For donations over $1000, please send a check or money order payable to VCCF-Thomas Fire Trail Fund and mail to VCCF, 4001 Mission Oaks Blvd, Suite A, Camarillo, CA 93012.